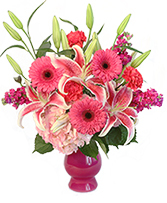 Looking for a modern twist to an old classic - this bouquet is just what you need! The Southern Peach Bouquet brings you a subtle and sophisticated look with a bit of modern style as well, charming and easy on the eyes. 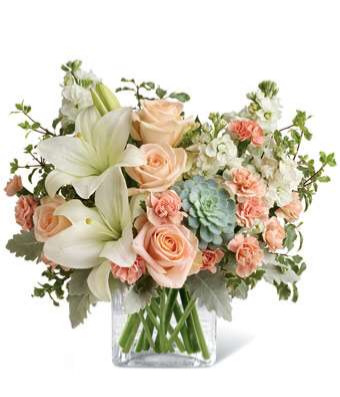 With beautiful pastel tones, this bouquet brings a room to life with it's artful arrangement. 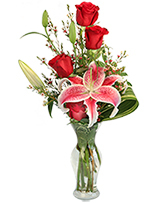 Peach colored roses surrounded by white lilies, peach carnations and greenery - but the best part? All of this surrounds a green echeveria succulent. The fun new accessory to any bouquet, this delicate succulent adds a modern touch and is guaranteed to delight any recipient of this bouquet. Get a handle on spring with this delightful array of floral favorites in a charming white bamboo basket accented with lavender ribbon. Surprise someone who could use a lift. It will make you both happy. 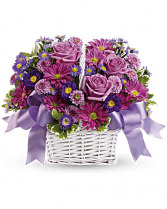 The cheerful bouquet includes lavender daisy spray chrysanthemums, dark purple Matsumoto asters, lavender cushion spray chrysanthemums and purple Monte Cassino asters accented with fresh greenery. The flowers are delivered in a white bamboo basket accented with a lavender gingham ribbon.